When it comes to desserts, I have very little discretion. The only things I truly dislike are flan and creme brulee (a texture issue), I’m not really a cake or cheesecake lover, and chocolate and fruit aren’t so much my jam, but, of course, if there’s a chocolate cake with fruit available I’m not one to exercise any restraint. I will, however, skip the meal and go straight to dessert whenever there’s coconut involved. Toasted coconut is one of life’s greatest pleasures – and, in my opinion, makes for a great garnish to any dessert. A sprinkling of toasted coconut is great on ice cream, cupcakes, in a pie, and especially baked into a cookie. 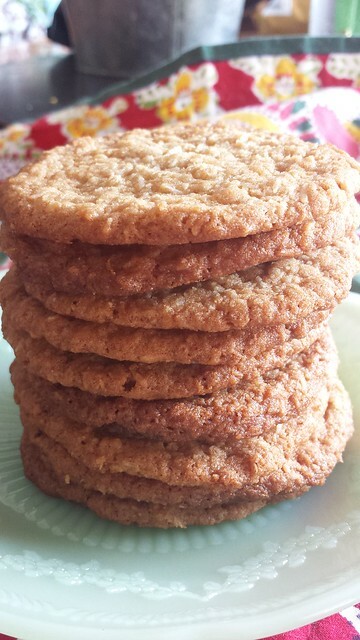 These cookies go beyond a garnishing of coconut and really put the coconut on display. 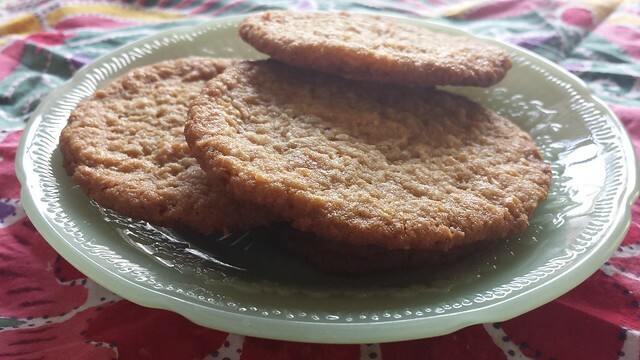 The result is a crispy, chewy, buttery coconut cookie. The original recipe calls for coconut chips, which I had trouble locating. Usually I use sweetened coconut for toasting purposes because it’s cheap and easy to locate, but this time I bought a bag of unsweetened coconut flakes at Target and it worked really well. The flakes were really fine and incorporated well into the dough. You could use sweetened coconut if it’s all you have at the grocery store, but if you do, I would consider really backing off on the sugar (starting with half and tasting) or rinsing the sweetened coconut in a strainer and letting it dry out (apparently this removes most of the sweetness). Unsweetened coconut is hard to find, but I generally can find it at Target or Trader Joe’s and stock up when I see it. I also browned the butter, which is easy, but takes some time. You could just use softened butter and skip step 1, but that sort of goes against my life’s mantra of “anything worth doing is worth overdoing”. Browned butter is just so darn decadent and delicious that it’s worth the effort. If you use regular butter, omit the 2T of water. 1. Cook the butter in a small saucepan over high heat, stirring frequently until it begins to foam and brown. It will burn in no time at all, so once the foaming begins, keep a close eye on it and remove from the heat when it starts to smell nutty and turn brown. Transfer to a small container (I used a glass pyrex measuring cup) and place it in the refrigerator for a few hours to solidify. 2. Preheat the oven to 350. Beat the butter, sugars, and 2T of water together until light and fluffy. Add the egg and vanilla, beat to combine. Add the baking soda, flour and salt and mix until well combined. Fold in the coconut. 3. Scoop the dough into 1T sized balls and bake for about 11 minutes until golden brown. Allow the cookies to cool and set on the cookie sheet before transferring to a plate. Store in an airtight container.